PGA professional Larry Flesner, who most recently was the head professional at Oak Hills Country Club in Ada, passed away July 14 at age 70. 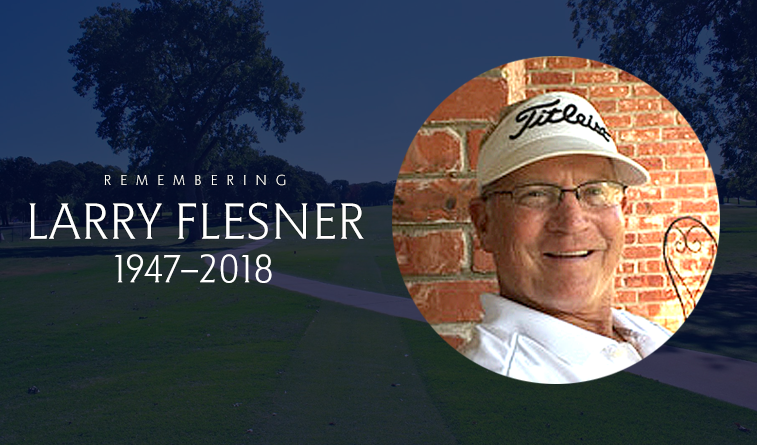 Flesner, born September 1, 1947, began his golf career helping Duffy Martin build Cedar Valley GC in Guthrie in the early 1970s. In 1982 he began a 23-year career at John Conrad Golf Course in Midwest City. He also worked at Choctaw Creek before going to Ada CC. Born in Stillwater, Flesner traveled extensively as the son of an Air Force Colonel, but came back to his roots, becoming a Sooner, a member of Sigma Alpha Epsilon Fraternity and graduating from the University of Oklahoma in 1969. He was commissioned into the Air Force the same year, where he served until 1972. He was a lifetime member of the PGA of America with 42 years of service. A Memorial Service in his honor will be held on Thursday, July 19, at 2 p.m. at Ford Funeral Services, 305 Sooner Road in Midwest City. In addition, there will be a Celebration of Larry’s life held on Sunday, August 12, at 3 p.m. at 1501 Cedar Valley Manor in Cedar Valley.